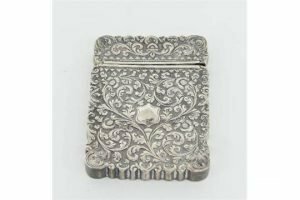 An Indian white metal card case chased with floral scrolls. 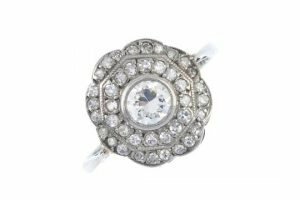 An early 20th century diamond cluster ring, the brilliant-cut diamond collet within a single-cut diamond scalloped surround, to the tapered shoulder and plain band. Principal diamond estimated weight 0.35ct. 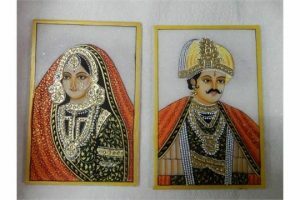 Two alabaster panels with painted and jewelled decoration of a Maharaja and Maharana, unframed. 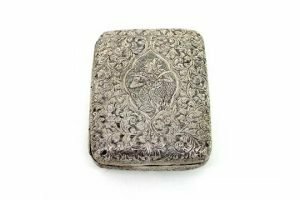 An Eastern white metal box decorated grotesque beasts and foliate scrolls. 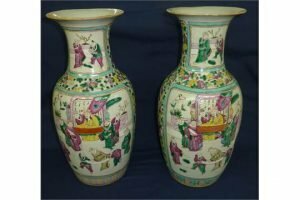 A pair of Chinese ceramic vases with floral detail and panels depicting various scenes with figures. 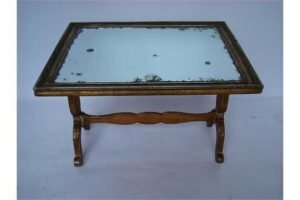 A giltwood and gesso occasional table, the top with moulded border inset with a mirror plate, on base with scroll supports united by a stretcher. 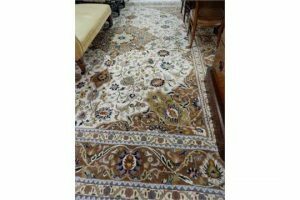 A large Eastern carpet, cream field with brown, blue and green floral pattern medallion centre and border. 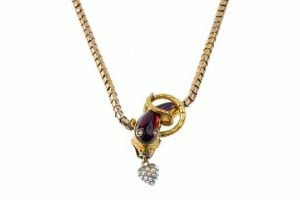 A mid Victorian snake necklace, circa 1850, the foil-back purple and red garnet snake head with diamond point eye highlight and seed pearl heart drop, suspended from the snake-link chain. 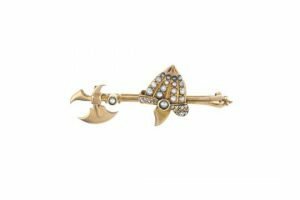 A late 19th century gold split pearl and diamond brooch, designed as a rose-cut diamond and graduated split pearl shield, to the axe terminal, with split pearl collet accent. 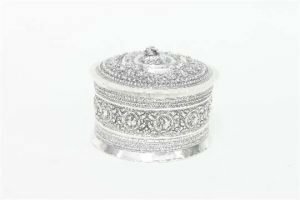 An Eastern white metal box, probably Burmese, of circular form, the slightly domed cover with recumbent mythical beast finial, the sides decorated figures and animals in octagonal reserves. 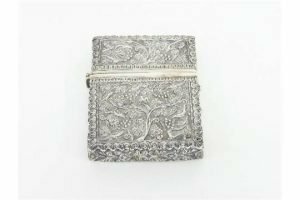 A fine Indian white metal card case chased with birds and vines. 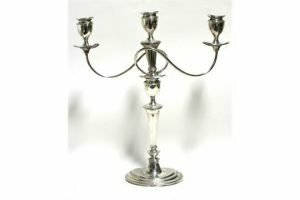 A table candelabrum in the late 18th century style, with two scrolling arms and vase-shaped sconces, on oval tapered column and a wide oval base, London 1971. 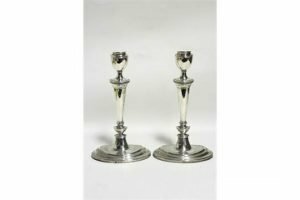 A pair of candlesticks in the late 18th century style, with vase-shaped sconces, oval tapered columns and on wide oval bases. London 1971. 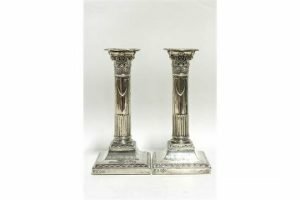 A pair of late Victorian candlesticks, the round Corinthian semi-fluted columns embossed with swags, on square bases with foliate borders, with removable drip-pans. Sheffield 1898. 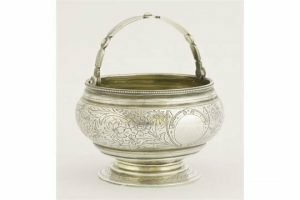 A 19th century Russian silver swing handled sugar bowl of compressed circular form, Moscow 1884, on spreading circular foot, with foliate engraved friezes surrounding vacant circular cartouches and beaded rim, gilt interior. 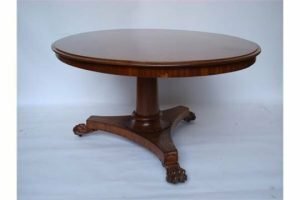 A 19th Century mahogany breakfast table, the associated oval top with tilt action on tapering pedestal and triform base raised on carved lion paw feet. 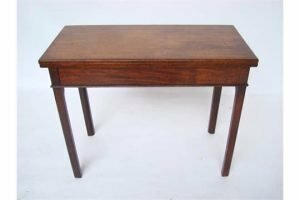 A George III mahogany fold over tea table, the top later baize covered with swing action on square chamfered legs. 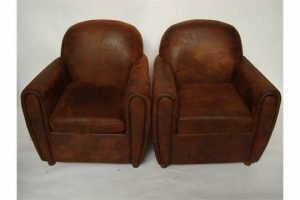 A pair of modern club armchairs upholstered in faux distressed leather. 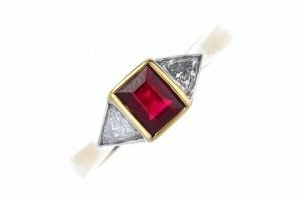 An 18ct gold ruby and diamond three-stone ring, the rectangular-shape ruby with triangular-shape diamond sides, to the tapered shoulders and plain band. Estimated total diamond weight 0.20ct. Hallmarks for Birmingham, 2002. 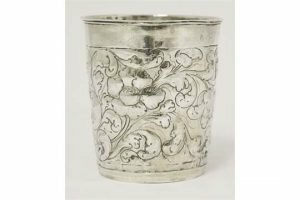 A Continental silver beaker of tapering cylindrical form, chased with trailing foliage, monogrammed and inscribed to base.